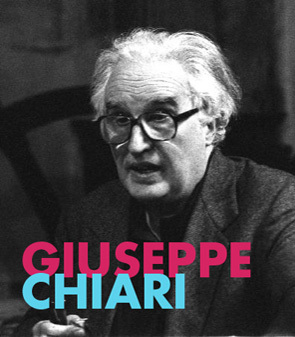 Giuseppe Chiari, musician composer and conceptual artist, was born in Florence in 1926. While he is studing math and engineering he starts to dedicate himself to music, his big passion, and begins to study piano and composition. His music activity began in 1947, meanwhile he writes critical essays about art and music, and in 1950 he writes his first compositions. He was more and more interested in visual music, and in 1961 sponsors the association of Vita Musical Contemporanea. Also the influence of the group fluxus and Group 70 have been very important to him and for his education. He attends important group exhibitions such as Documenta 5 in Kassel (1972) and several editions of the Biennale of Venice. Chiari is a supporter of the need of interaction between music, language, gesture and image, making an expressive-musical system built by short music pieces that, flowing from time to time without an order, give shape to complex music pieces. The aim is to highlight the expressive freedom and the concept of “vague” of the artistic creation. He composes the “music of action”, based on a complex way to esecution: besides the normal instruments there are also casual sounds that are used as essential parts of the music language. His first artistic works have notes and graphic representation of gesture, that become real images. 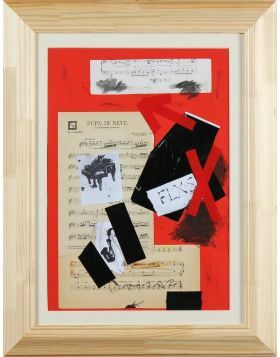 After these first works he creates collages using painting with signs, writings and stamps on pentagrams and photographies. The lenguage of collages has its full maturation in the '80s and '90s. 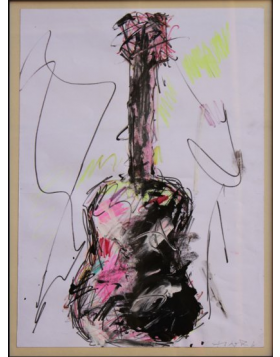 Chiari doesn't just use newspapers, colored sheet of paper, and scores, but also real instruments, guitars and violins, in order continue his research of the contamination between visual and sound. He dies in Florence in 2007.